Written and illustrated by Gruffalo’s duo Donaldson and Scheffler, the book shatters gender stereotypes: a young dragon who refuses to scare people and prefers to help them; a princess and a knight who would rather be doctors. However, the only female character is less subversive than it appears at first glance: the book reestablishes the girl as caring, mature, and ready to mediate in the concerns of males. 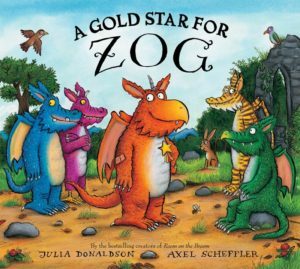 Zog is a rhyming book with excellent illustrations.